This week I visited the set of Godiva's, a Canadian comedy-drama being shot in Vancouver. It's all about the staff of a restaurant who are thrust into chaos when their executive chef suddenly dies of a cocaine overdose in the kitchen cooler! The photos from the set were taken by Jeff Weddell. Godiva's will air on the CHUM/City Network in February and March of 2005. This week I toured the Gellatly Nut Farm, near Kelowna. It was founded in 1920 by Jack Gellatly, who passed away in 1969. Recently the Central Okanagan Regional District agreed to turn the land into a park and museum, restoring the nut orchard to its former grandeur. Anna Olson is the charming host of the TV show called Sugar on Food Network Canada and I had a chance to meet her while she swung through Vancouver on her publicity tour. 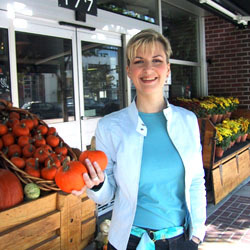 You can find out more about Anna and her new shop in St. Catharines, Ontario by visiting her website at www.olsonfoodsandbakery.com. 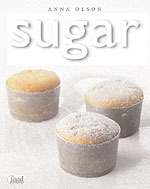 Her cookbook is called Sugar, Simple Sweets and Decadent Desserts, and if you buy it from amazon.ca through this website, you will help me maintain this site, for which I will be very grateful!